With a few dozen fans holding signs and yelling “Go Belmont,” the Bruins exit the Curb Event Center loading dock after a final practice, toss their navy duffel bags under the bus and stuff too tall legs into seats, downing some Chick-Fil-A as they prepare for the ride to the airport. Coach Rick Byrd and several players, including senior Reece Chamberlain (right), conduct last minute interviews with local media for a few minutes before the bus departs, skirting carefully through the 15th Avenue roundabout. Arriving at the airport, a woman everyone on campus recognizes with a shock of short white hair jumps off the bus to check in for the flight. Debbie Chenoweth, or “Miss Debbie” as everyone on the team calls her, handles all of the logistics for team travel, and she’s clearly the one in charge of the trip. In addition to managing all of the details and being responsible for team and player stats during the game, Miss Debbie serves as chief problem solver and team encourager. Whether a player has lost his ID or just needs a bubblegum pick-me-up before the game, Miss Debbie has the answer. In fact, she carries with her at all times a bag of candy that includes all of the favorite sugar-infused snacks for each team member and coach. The chartered plane is running about 20 minutes late so we wait on the tarmac, catching up with red shirt sophomore Taylor Barnette. He’s responsible for “The Shot,” the fall-away three-pointer that helped the Bruins win the OVC Championship and land Belmont its seventh trip to the Big Dance in 10 years. What many may not know is that he’s also working on an academic triple play: Taylor is majoring in communications with a double minor in entrepreneurship and Christian leadership. After a quick security check, the players, coaches and traveling staff have boarded the plane and been greeted by flight attendants enthusiastically wishing the team well. In moments, the plane departs for a quiet ride to Charlotte. Luggage is quickly loaded into another bus upon our arrival in Charlotte for the short trip into the city. We drive past the tournament site, Time Warner Cable Arena, a large venue with tons of signage announcing the NCAA Second and Third Rounds. Arriving at the Hyatt Place Downtown, hotel staff welcome the team and the first-floor, as well as the 10th floor lobby, are decked out in red and blue balloons and Belmont banners. Even the room keys and welcome letters reflect the Big Dance we’re here to attend. We have found our temporary home. Everyone checks in, gets settled in their rooms and scatters for dinner at restaurants in the nearby EpiCentre, a unique combination of cafés, restaurants and retail outlets a block from the hotel. We chat briefly with Director of Basketball Operations Tyler Holloway on the first floor who is waiting for the team which will soon depart for an off-site closed practice. In his sixth season with Belmont Basketball, Holloway supports the program with video analysis, player development, scouting reports, on campus recruiting and other day-to-day activities. Assistant Athletic Director for Broadcast and Media Relations Greg Sage arrives, and we join him for the quick, two-block walk over to the arena. After several years working in variety of TV roles, including as a producer at The Golf Channel, Greg moved to Nashville in 2004 to be closer to his then-girlfriend and now wife. He’d conversed with Coach Byrd a few times thanks to a mutual friend, and it was the Coach who first told him about a job opportunity that was becoming available in Belmont Athletics. It was also Coach Byrd who conducted Sage’s first Belmont job interview… while playing 18 holes of golf at Richland Country Club. 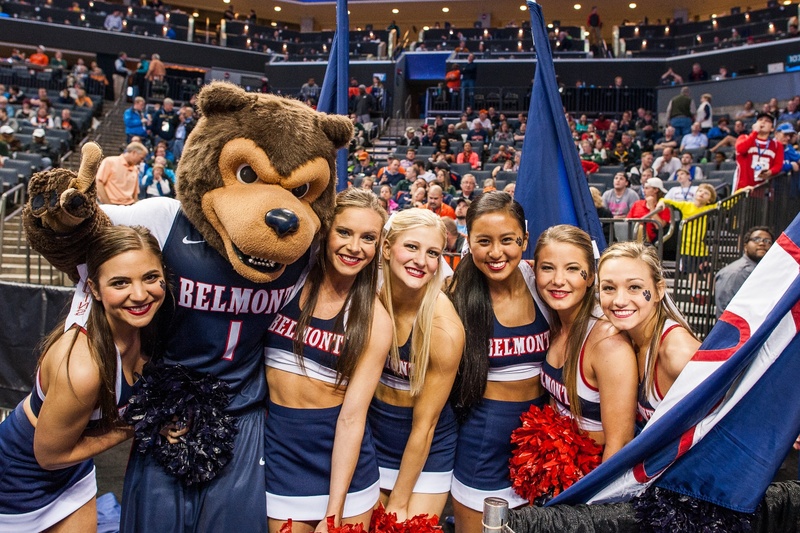 Now in his 10th year, Greg oversees publicity for all of Belmont’s 17 NCAA Division I athletic teams as well as manages the Bruin Sports Network, the BelmontBruins.com website, sport publications and all aspects of media relations and sports information for the Bruin program. You’ve likely also heard him teaming with Voice of the Bruins Kevin Ingram as color analyst for Bruin Sports Network broadcasts. This morning we tag along with him to his 10 a.m. Sports Information Directors (SID) meeting with representatives from all the teams playing in Charlotte as well as staff from the NCAA, CBS and Westwood One Radio. Multiple details are discussed in terms of how and when press conferences will occur, the length of commercial breaks and player access for interviews. After the meeting, the entire group is led on a quick tour of the arena to review the location of player locker rooms, press conferences, arena floor access, media information table and photographer positions on the floor during the game itself. Only 10 years old and home to the NBA’s Charlotte Hornets, Time Warner Cable Arena seats approximately 20,000 and features the largest scoreboard in any indoor entertainment venue in the country (38-feet-high by 36-feet-wide) and weighs 80,000 pounds. We stop by the Media Buffet to grab a quick lunch before the team arrives and sit down at a table with Belmont Vision editor Courtney Martinez, a senior mass communications major with a sports and media minor. Applying for postgraduate fellowships with the NCAA and Pac-12 conference, Courtney is soaking up all she can from her first trip to the tournament in hopes it can give her an extra edge in her interviews after graduation in May. The Belmont Bruins arrive at the arena and adjourn to their locker room, which will be open to media for 30 minutes of interviews while Coach Byrd, Evan Bradds, Craig Bradshaw, Taylor Barnette and Reece Chamberlain attend formal press conferences with TV and radio outlets covering the tournament. As Coach Byrd continues his interviews, the four players return to the locker room and join their teammates in chatting with gathered media, watching games on TV and prepping for the shoot around. Senior Spencer Turner, the self-described prankster on the team, and junior Jeff Laidig join in on the action, pretending to do their own interview while sophomore Barnette recounts—again— for the cameras how his college career began, ironically, at Virginia. With interviews over, the team takes to the arena floor for an open shoot around, practicing the basics in front of a small crowd of onlookers while Coach Byrd speaks with the CBS announcers for Friday’s game, Bill Raftery, Jim Nantz and retired NBA player Grant Hill. A number of players’ parents have made the trip to Charlotte to see their sons’ game, including the Chamberlains and Turners, who have witnessed most of their sons’ games throughout their college careers. Both sets of parents note their pride in what Reese and Spencer have accomplished, emphasizing how much they’ve seen their sons grow up during their time on the basketball team. Our conversation is interrupted by Grant Hill, who wanders over to meet the parents, discuss the team and get some insights on the players prior to Friday’s game. A few people, including Dr. and Mrs. Fisher, have gathered in the lobby to await the arrival of three busloads of Bruins fans along with the cheerleaders and pep band. After being stuck for a bit in Charlotte traffic, the groups arrive to warm welcomes and high fives. Nearly every individual comes sporting Belmont gear. The Hyatt Place lobby has been overtaken by Belmont… students, fans, alumni, coaches, players and parents wander by, intent on grabbing a quick breakfast. Everyone, even hotel staff, is wearing Belmont shirts, and the lobby is decorated like the Beaman lobby for Game Day. Enthusiasm is high. Students gather one last time in the lobby and receive final instructions for the game and the post-game plan, win or lose. On the ground floor, the cheerleaders and pep band kick off the party. Bruiser has his Dancin’ shoes on! The bus backs up near the entry, and the team walks through the crowd for a rowdy and encouraging send off to the game. With time to kill before they take the floor, the players visit Miss Debbie, who hands them each an NCAA pin to clip on to their shirt. The pin gives them access to the arena to watch the end of the Michigan State/Georgia game and perhaps to scout out a potential next opponent. Once again taking its seat at the March Madness table, Belmont University men’s basketball nearly orchestrated one of the most memorable outcomes in NCAA Tournament history, taking two-time defending Atlantic Coast Conference champion Virginia to the limit over the course of a two-hour contest. The Bruins got off to a fast start and grew their lead to six points just six minutes into the game. The boisterous, and largely Belmont partisan, crowd was loving every minute of it. By halftime, though, the Cavaliers had tightened their defensive grip and the teams went to the locker room with Virginia up by 8. A Belmont run late in the second half, capped by Bradshaw’s fifth three-pointer of the contest, got Belmont within 62-60 with 4:37 left. The Bruins were standing toe-to-toe with another national power and were on the verge of breaking down the door. But alas, it was not to be. While the Bruins played with heart and courage right to the very end, Virginia closed the game on a 17-7 run to win a final decision 79-67. While the Bruins played exceptionally well against one of the nation’s top defensive teams, destiny was denied on Friday afternoon before a crowd of more than 16,000 fans. Click here for video highlights from the game and here for photos from the game and the entire trip. By 6 p.m. students are boarding buses for the long, late-night ride back to Nashville, while team members meet up with family and friends who attended the game. Due to NCAA regulations, the Bruins will spend another night in Charlotte before boarding the charter flight early Saturday morning for the ride back to Nashville… counting the minutes until the next season can start.